Bill White, director for offshore wind at MassCEC, speaks to group at Tisbury senior center Monday. With offshore wind developers inching their way through the federal permitting process, government and company representatives stopped by the Vineyard this week to gather feedback and provide an update on their work. Representatives from the federal Bureau of Ocean Energy Management (BOEM), which regulates offshore wind projects in the U.S., gave an overview of the permitting process, which involves years of surveys and analysis for each site. 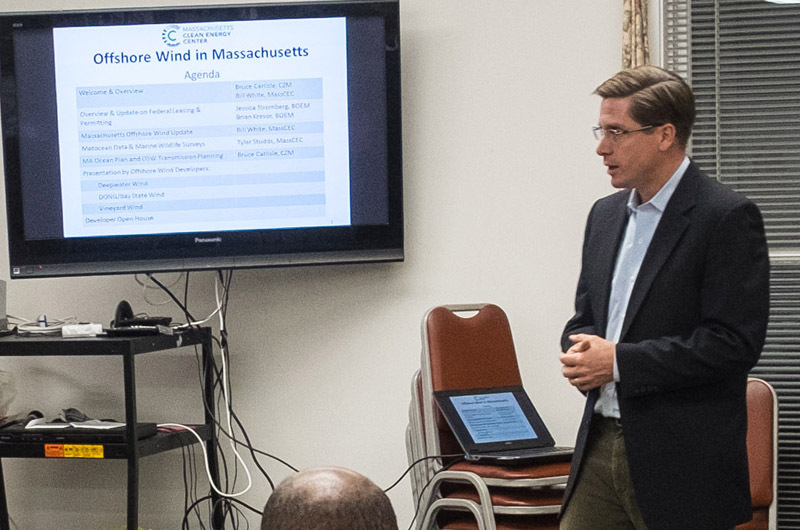 And members of the Massachusetts Clean Energy Center (MassCEC) spoke about new energy legislation in the state and efforts to mitigate the effects of wind turbines on marine species. The Danish company Dong Energy this year obtained a lease on a large area of federal waters south of the Vineyard, as did a partnership between OffshoreMW (owned by the Danish company Copenhagen Infrastructure Partners) and Vineyard Power, the Island energy cooperative. Deepwater Wind, with financial backing from the D.E. Shaw Group of New York, is pursuing a project off Rhode Island. Dong has already completed initial surveys of the ocean floor. The Vineyard Power partnership plans to make its final passes with a survey vessel this week. The two projects are now billed as Bay State Wind and Vineyard Wind, respectively. 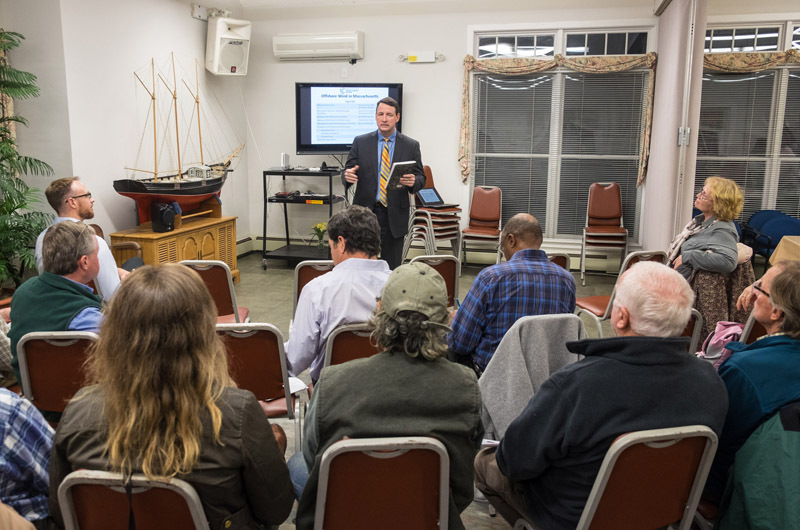 Bruce Carlisle, director of the state office of Coastal Zone Management, which along with MassCEC organized the event at the Tisbury Senior Center on Monday, said one goal was to keep the public engaged in the process. 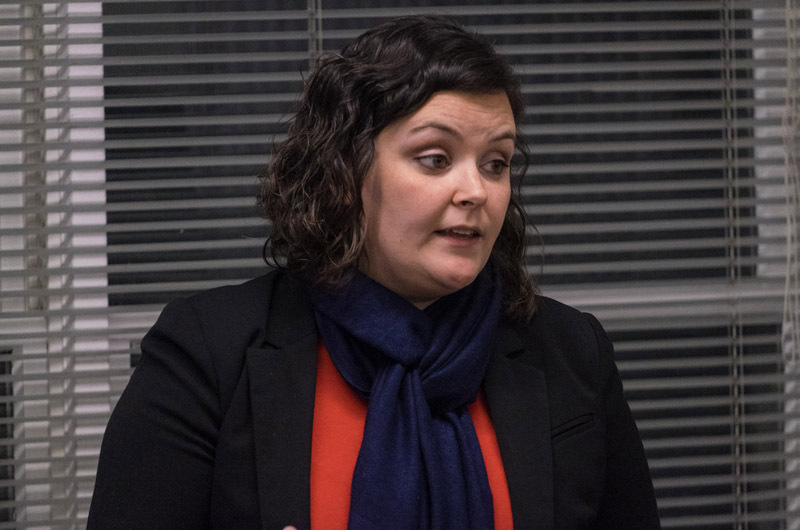 A series of upbeat presentations were peppered by comments from Island residents, some of whom expressed frustration over a process they felt was out of their control. Tisbury selectman Tristan Israel praised the work of the federal agency, but pressed for more local involvement, noting a renewable energy task force that had included several Islanders and helped refine the federal wind energy area first proposed in 2009. “You guys are doing great,” Mr. Israel said. “But I’m a little disappointed that the task force has kind of been blown off.” Bill White, director for offshore wind at MassCEC, and Jessica Stromberg, project coordinator at BOEM, were open to his suggestion that the group reconvene in the near future. He cited projections that 1,600 megawatts of wind power could offset 2.4 million tons of greenhouse gas emissions per year, or up to 11 per cent of the state’s total energy consumption, helping to mitigate climate change. BOEM has collected a large amount of data related to whales, birds and sea turtles, which could help mitigate the harmful effects of offshore development in the region. About 60 endangered right wales have been spotted from the air since 2011, which will help create a baseline for further study, said Tyler Studds, senior manager of renewable energy strategy for MassCEC. Getting the energy ashore will require miles of undersea cables, and port facilities that can handle heavy infrastructure. Building and maintaining the wind farms is expected to generate a large number of temporary jobs in the region. Mr. Israel said he hoped to see the Island benefit as well. The Vineyard Power project includes a community benefits agreement that could help jobs stay on the Island. Chilmark selectman Warren Doty suggested that since construction is still well in the future, the state could help fund vocational programs for high school students to learn the relevant trades. “These are going to be high-value jobs,” he said, adding that schools would likely be unable to handle the costs themselves. “We hear that loud and clear,” said Mr. White, who said he sees that type of training as an opportunity for the state as it works to kickstart the offshore wind industry. Mr. Carlisle spoke in more detail about the issue of connecting offshore wind energy to the grid, although he said it is somewhat uncharted territory for his agency, which focuses on coastal resource protection. He pointed to a number of substations where the cables could come ashore, including at Brayton Point and West Barnstable. Peter Cabana, a civil engineer and Island resident, pressed for a clearer outlook. “Why hasn’t anyone looked at where this stuff is going to go?” he said, recalling discussions with government officials some time ago that he said also left the question unanswered. Mr. Carlisle said an answer would depend at least partly on guidance from stakeholders. Dong Energy has already decided to bring its cables ashore at Brayton Point. Representatives from the three companies provided short updates on their work so far, which has depended in large part on the cooperation of commercial fishermen who share the waters. Dong Energy saw a cool reception from Vineyard fishermen during a visit to the Island last year. The company worked with John Williamson, a fisherman from Maine, to help coordinate the surveys this year, and with Steve Welch, a fisherman from Plymouth, who accompanied the crew on its survey vessels. Vineyard Power worked with New Bedford fisherman Jim Kendall, who distributed computer thumb drives that allowed fishermen to see the survey area overlaid on their navigation charts. Paul McDonald, a fisherman out of Menemsha, complained that Dong Energy had failed at least once to respond to his efforts to hail the survey vessel, and he worried that the addition of turbines would only complicate matters in the future. “We need to figure this out now,” he said. Mr. Carlisle assured him that various groups were working to get everyone on the same page. But that was also a work in progress. “We may need to reassess how we are doing that,” Mr. Carlisle said. Links to the federal reports on marine species are available on the Martha’s Vineyard Commission website, mvcommission.org. I visited Glacier National Park (USA) 5 years ago and was stunned to see that then, of 125 glaciers when the park was created 1910 (150 in 1850), only 25 glaciers still existed. The only contentious issue is when they will all be gone, 2020 or 2030. There is no disagreement on this, that Glacier National Park in Montana will have NO REMAINING GLACIERS IN 13 years or LESS. These glaciers took tens of THOUSANDS of years to form. We can debate the cause of this, we cannot debate the fact of this dire situation. Reported today: 2016 Likely to Top 2015 as Hottest Year on Record. and when all these rusting hulks fail.... who will tear them down? also who will give me back my skyline? wind power is failing all over the world and driven by economics of subsidy as they make -0- economic sense and only profit the developer due to subsidies NO TO OFFSHORE WIND FARMS AND ONSHORE TOO. I think you are completely wrong here. Most of europes renewable energy comes from wind. It's clean, safe, and WORKING. And growing. And creating many jobs. Who cares about "your" skyline in 20 years, when climate change has destroyed most of the planet. Your carbon polluting skyline will keep growing that nasty haze of "beautiful" sunset colors. Wake up. Subsidies? The oil and gas industry is the MOST subsidized, and has been for the last 75 years. It's your old way of thinking that put the planet in the position we are in now. Before you point fingers at others and work to tear down a potentially game changing technology for our planet , look at yourself, your life style, and ask if you are contributing to carbon emissions or trying to do something to get us off them. The people working on this project are trying to create a cleaner way to produce energy, which lowers carbon emissions, and also makes a profit while doing that. How can you consider this bad? It's a win win. And if you don't believe in man made climate change, go put your mouth on the exhaust of your car and let me know if you still think it's natural causes. Jump on board the winning side of history here and support projects like this which aim to change our current energy model by providing clean energy and jobs. Dan, I couldn't agree with you more. Renewable energy is the winning side. Miami is in the process of flooding out due to rising tides -- my sister in Miami reminds me of the road closures in her city due to flooding in my calls with her. Florida is slowly turning from a Red state to an underwater state. It is happening now, and will happen here. Join the winning side. You are 100% correct. The taxpayers and ratepayers will ultimately be 'on the hook' financially for the removal of these rusted hulks, long after the promoters have pocketed their profits (thanks to subsidies and mandates for utilities to buy this overpriced subsidized power)I guess we haven't learned from the taxpayer loss of over a half BILLION dollars with the failed solar company Solyndra. Here's a thought- if it was financially viable, then private funds would find their way to support the projects without government subsidies, and mandates for utilities to purchase the grossly overpriced power *4x* current rates or more. concerned MV person has a valid point. Back when Cape Wind was on the table, if one were to read through the 4,000 page environmental impact study, one would see the wind turbines have a 20-25 year useful life. When they are no longer viable the plan called for the turbines to be cut off at sea level, forever leaving 400 tubes in the seafloor. Better check the facts James. Cape Wind proposed a 130 turbine array, not 400. Also, Concerned MV is also making patently untrue claims in regards to the viability of wind installations around the world; they are not failing as stated. Many countries are reaping huge benefits from wind(as well as other renewable energy sources). Currently Denmark is generating almost a third of their electricity from wind. You are entitled not to like wind turbines. Claiming that they don't work is another story entirely and simply not supported by the facts. Look- they may have a 25 year life but you can replace the turbine. Denmark was a pioneer in developing commercial wind power during the 1970s, and today a substantial share of the wind turbines around the world are produced by Danish manufacturers such as Vestas and Siemens Wind Power along with many component suppliers. Wind power produced the equivalent of 42.1% of Denmark's total electricity consumption in 2015, increased from 33% in 2013, and 39% in 2014. In 2012 the Danish government adopted a plan to increase the share of electricity production from wind to 50% by 2020, and to 84% in 2035. Denmark had the 6th best energy security in the world in 2014. Sweden, France, Germany, even Italy will be at 50% in the coming 5 years, not to mention the developing countries. 50%! And we don't even have one wind farm in MA yet. Embarrassing on a global scale. Why are we being left behind in the energy race in America? Because of people dragging their feet and whining about 25 year life spans. Solar panels have 25 year life spans. You know what doesn't? Our shoreline. This is a contentious issue as it touches two emotional subjects, 'man made global warming' and economics. While I agree the climate is changing, it always has, independent of mankind, I am not a believer in 'man made global warming', but even if I were, the world would have needed to have banned all fossil fuels about 50 years ago to avoid the apocalypse that is predicted by some, so building a few windmills is a meaningless gesture from a practical standpoint. Now as for economics, the cost of wind power is at least twice that of oil or natural gas, generally more, depending on location. So this is an additional tax on the population that can least afford it, the only way these projects are viable is because of taxpayer funded subsidies. This increased cost of power, intern, makes US industry less globally competitive, whereas low cost power is a potential competitive advantage. Finely, there's the issue of variability of supply. Assume for a moment that, like mentioned in some of the comments above, that 30% or 40% of our power is supplied by wind or solar, what happens during a summer heat wave when there's little or no wind, and/or the sun has set. The key point is energy storage remains an inconvenient unresolved issue; it's a technology in its infancy, currently hugely expensive, while only offering a minimal (<10 years) useful lifetime, as its typically based on batteries. BTW one of the reasons wind works in Denmark is that they can easily buy power from other European countries if their wind supply drops. Once the US takes fossil fuel plants offline we won't have a backup plan like Denmark. Bottomline the US still doesn't have a workable, common sense, energy policy; which is just one more thing the government has failed us on, but that's a topic for a different time. John, The idea that "it's too late to try, let's just give up" is sad, lame, and pessimistic. Why not give a damn about something and try? Especially about preserving our shared environment. Why not try to think about the generations who are being born today, into a world where people like yourself didn't care and didn't try to make it a better place for them? Thanks for the helping hand. On the economic issue, I think you have some fine points. Battery storage is a major issue. But don't you think the people who build these thought of that? Nobody said this wind farm would turn the fossil fuel power plants off. That's a ridiculous statement. Why does renewable power scare people? I don't understand. You don't protest against the natural gas plants being built, but you protest against a wind farm? The award of offshore wind contracts with state utility companies has been delayed until May 23.